For those of us who love shoes, we tend to fill up our closets with dozens of wonderful types of shoes of all colors and styles. From tennis shoes to high-heel shoes, to sandals, shoe collections can grow quickly. So from time to time when your closet gets a bit too full, it’s a good idea to short through your assortment of shoes. But instead of throwing them away, consider repurposing them instead. These surprising ideas are a great way to make use of old shoes around the house. Turn an old pair of flats into a hanging jewelry rack. You’ll have an instant place to store necklaces, bracelets, and even earrings. Get creative and decorate the shoes, or leave them as is. You decide how creative you want to be. Recyclart gives more info on how to create this DIY project. 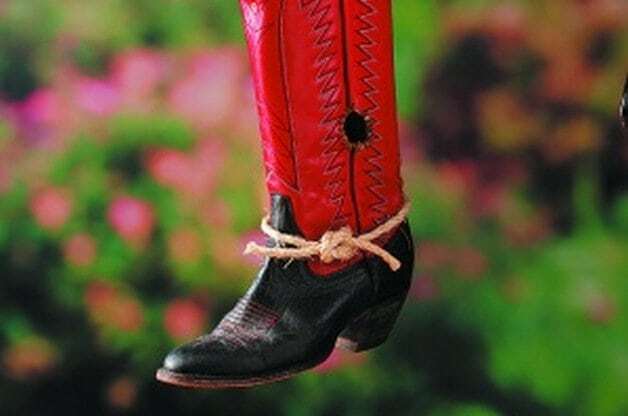 Turn your old cowgirl boots into a birdhouse. All you’ll need to get started is the old boot, some simple tools, and a few DIY supplies. Follow these step-by-step instructions to create your own adorable boot birdhouse. This is one DIY project that is sure to make your garden area the most unique on your block. First, disinfect the shoes. Then attach the shoes to a tree stump or on cinder blocks — or set one on a windowsill or the porch. And, finally, plant herbs directly into the shoes. Learn how to make a repurposed shoe herb garden here. This DIY project turns old high heels into a nifty ring rack display. You’ll need to add ring holders and potentially a few decorations, and then you’ll be ready to display your ring collection in a unique way. For a tutorial on how to make your own high-heel ring holder, visit The Toasted Coconut. 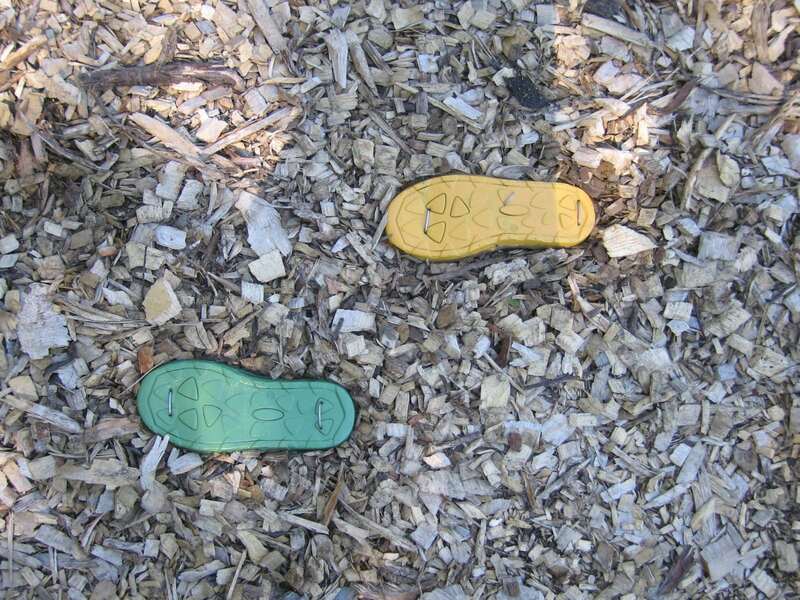 Add a bit of flare to your garden or pathway by repurposing shoes as stepping stones. 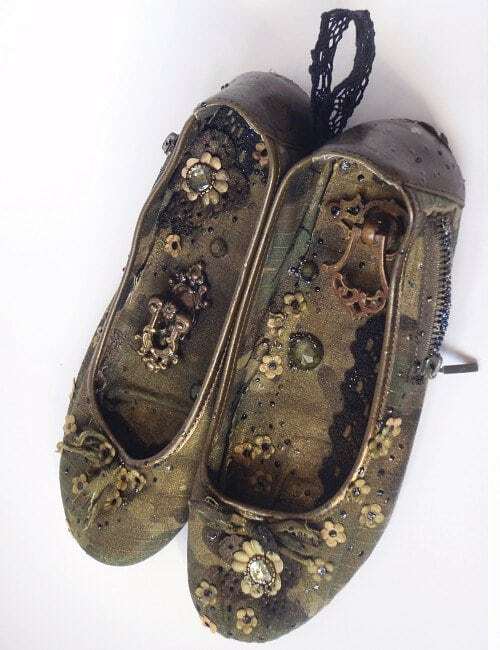 You’ll need at least a few pairs of old shoes to start this fun project. Outdoor Mama provides an easy-to-follow tutorial here. Book ends are usually pretty expensive. So, instead, take an old pair of high heels and turn them into fancy bookends. This works well for other types of shoes, too, like old boots. HildaGotRocks teaches you how to make your own here. 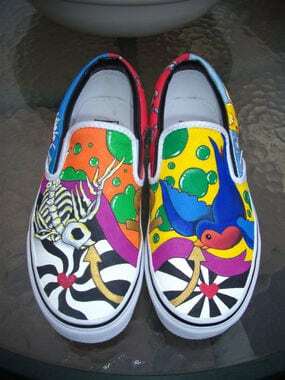 If you have an old pair of white shoes that you can’t bear to part with, get out some paint brushes and get creative! For a list of supplies and how-to instructions, visit Empress of Dirt. 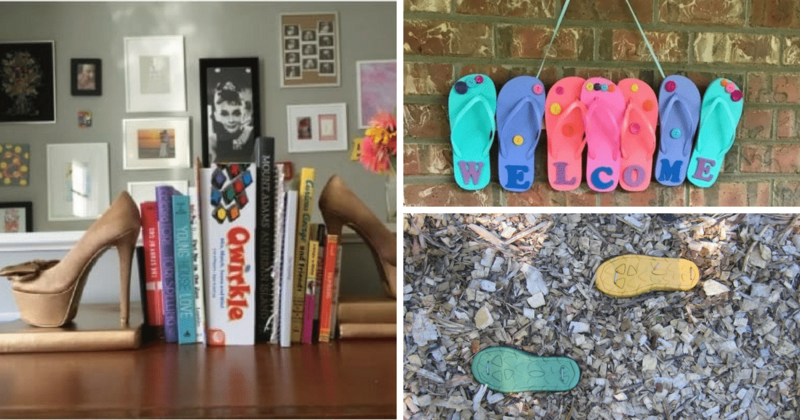 Turning your old flip flops into a welcome sign is unconventional, but it represents a fun, friendly, and casual atmosphere. If you don’t have enough old flip flops for this DIY project, run down to the dollar store and grab a few more. My Unentitled Life gives the full DIY details. To repurpose your old high heels into a coat rack, all you need is two or three pairs of old shoes and a plank of wood. Attach the shoes onto the board, hang it on your wall, and you’ll have a convenient and kitschy way of hanging your coats, scarves, or towels. 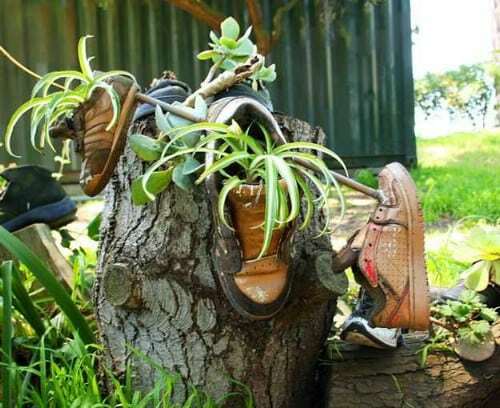 Repurpose your old shoe into a cactus planter! 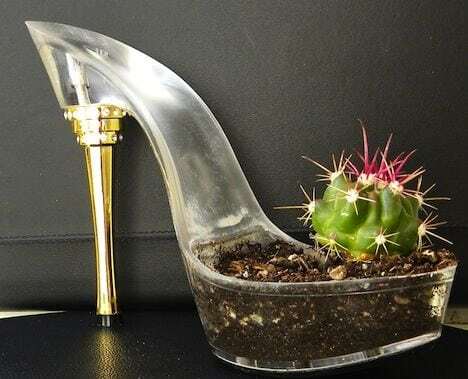 Find the tallest, old high heels in your closet and follow this three-step DIY project to create a stiletto planter you can place anywhere in your house. Beyond your own shoes, you might even have some old baby shoes lying around. Try repurposing baby shoes as pincushions. It’s not only useful, but you’ll have a memento of your child in eye’s view. Or you can even make one as a family gift for an aunt or grandma. 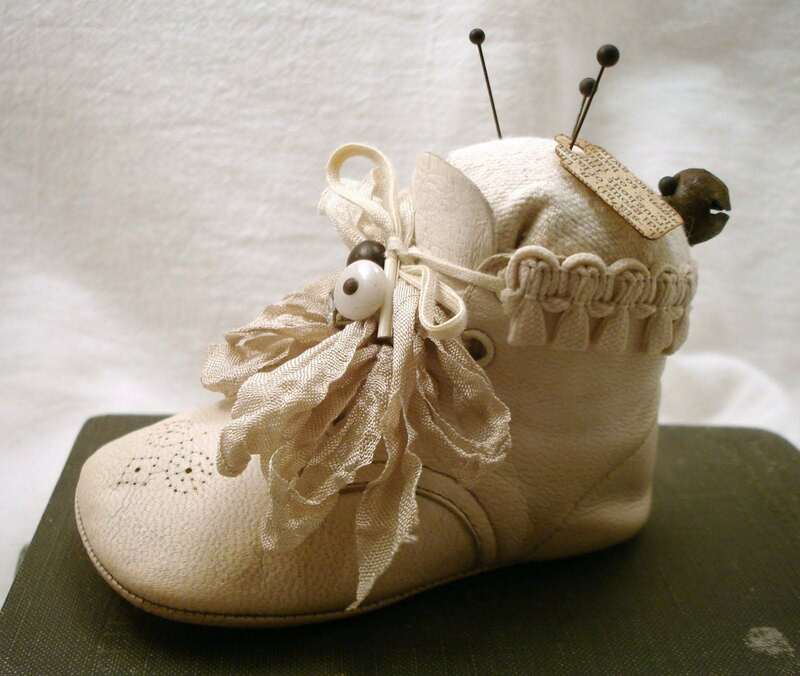 Make your own baby-shoe pincushion by following the directions here.